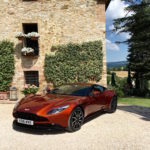 “For the love of beautiful.” Within the colorful walls of the Italian villa, Aston Martin CEO Andy Palmer sits in an armchair and utters the phrase that will define the British automaker for years to come. 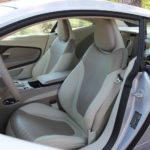 Not five feet away, I listen from on my own piece of doughy furniture, visualizing the ignition button on Aston Martin’s new DB11 sports car parked outside. The launch of Aston’s DB9 successor is accompanied by an ambitious declaration: one all-new model will debut each year between now and 2020, at which time the luxury marque expects to produce 7,000 vehicles per year – up from 4,000 this past year. 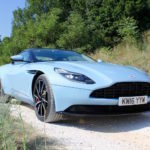 “The DB11 is probably the most important car in Aston Martin’s history,” continues Palmer, “and the U.S. is the most important market to us right now.” These punctuated bits of information may be solely for the benefit of the American journalists huddling around the executive, but the frankness of his speech suggests otherwise. “We’ve agonized over how to communicate who we (Aston Martin) are to Americans. It’s like Cricket: to us, it makes sense, but Americans have only heard of it and don’t quite understand it.” Palmer goes on to admit that Aston Martin underperforms in the U.S. and fails to create a distinction among competitors like Bentley and Ferrari. Fortunately, the automaker believes that this is about to change, that it’s cracked the code. The DB11, along with Aston Martin’s core model replacements (Vantage, Vanquish) and the DBX crossover due in 2019, will attempt to embody the new, “beautiful” creed. “It’s not a commodity; we need you to love what we love,” Palmer concluded. I don’t envy the blokes tasked with replacing the DB9. It is, after all, one of the most stunning vehicles ever crafted. For the last dozen years, the DB9’s silhouette has loosened the jaws of onlookers while its V12 bellow melted their membranes. It’s fortunate, then, that I held no authority in the DB11’s design, because its presence is bewitching. 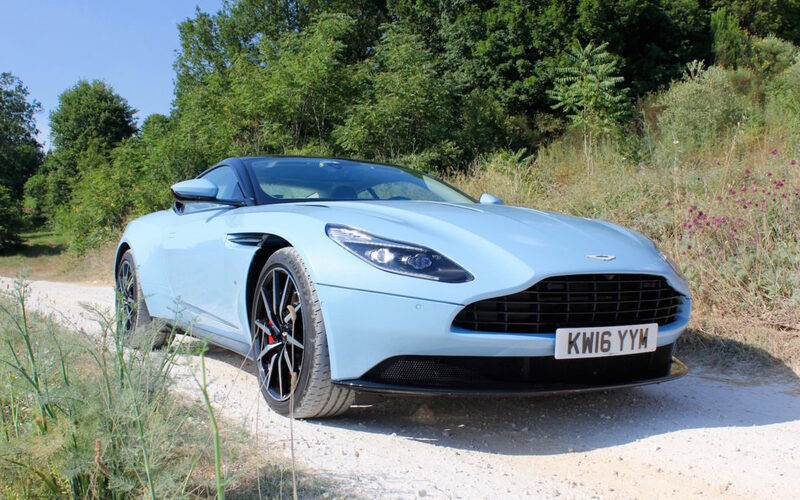 Aston Martin’s Chief Creative Officer Marek Reichman attempts to breakdown the DB11’s physique by a one-third to two-thirds styling logic, but I’m already lost in the sports car’s flawless form. In the brief moments where I return to reality, I catch notes about the car’s single-piece clamshell hood, wider aluminum grille, shark-like nose, and airflow manipulation. There would be time to analyze each body panel, but not until the DB11’s amalgamation has totally consumed me. Confidently, Aston Martin has transported an original DB9 from its Gaydon headquarters to pose alongside to its next of kin. 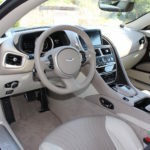 Rather than attempting to rehash any specific element of the DB9, Aston’s designers have revolutionized the styling characteristics that make spark enthusiast awe. More than any Aston Martin models before, the DB11’s aerodynamics compliment its design. 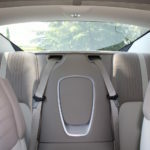 The aggressive chin splitter pulls air over the front tires, through the curly-cue air ducts, along the jutting side skirts, into the open C-pillar buttresses and through the trunk. 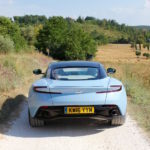 The exiting air is tightly funneled over the rear end in the form of a patented “airblade.” As the DB11 gains speed, this invisible spoiler can propel air up to a meter high. 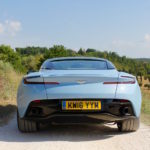 Wider, longer, and lower than the DB9, the DB11’s bonnet seems endless, its rear haunches are nearly horizontal shelves, its floating roof strake is like a stylist’s swath of color in an aphotic hairdo, and its rear has been creased into slivers of light and metal. Even motionless, the DB11 is like reveling in a production of Troilus and Cressida, leaving the audience in a passionate sweat. The DB11’s external styling commands that essential first impression, but owners can only admire their vehicles for so long before they must climb inside. 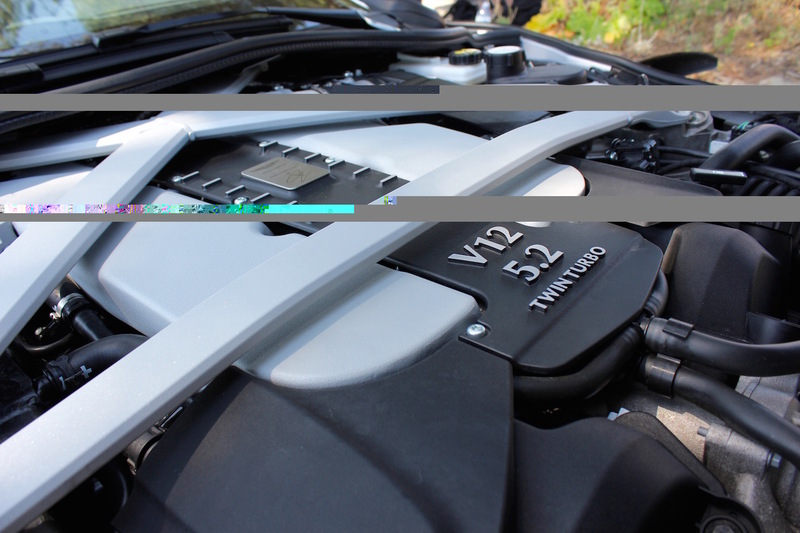 The DB9’s analog gauges, low-resolution infotainment system, and flat dash simply won’t do in 2016. Welcome to an all-new Aston, dear readers. 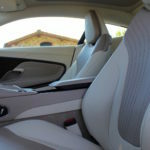 A familiar blend of supple leather, Alcantara, ornate stitching, and glass surfaces is now enhanced by a choice of open-pore wood or chopped carbon inlays, a Bang & Olufsen sound system, and Mercedes-Benz’s electronic architecture. Finally, the concept of Aston Martin luxury permits a glimpse of modern technology. 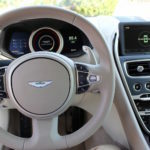 Don’t expect a semi-autonomous S-Class experience, despite the DB11’s employment of Merc’s COMMAND system within a 7.0-inch center screen, digital TFT driver display and gauges, and controller that sits in front of the console armrest. 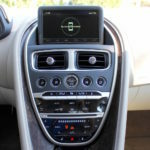 As a result, drivers can access a surround view camera system, smartphone integrated contacts and music, navigation, and vehicle settings from either the steering wheel controls or mouse. 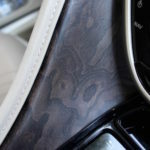 The center stack has also been updated with a myriad of touch controls and a line of toggles for key functions like the defroster and fan speed. 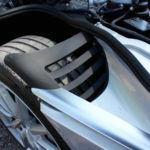 Driver and passenger are treated to sculpted front buckets that provide a respectable amount of support but stop short of gripping too tightly – after all, this is a car designed with the more “robust” American buyer in mind. 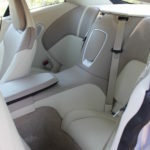 Rear passengers benefit from an ounce of additional legroom compared to the DB9, but the molded seats are still no place for full-size adults. The enveloping cabin is exquisitely constructed by hand yet there is nary a man-made fault to be found. Each stitch and panel is perfectly fabricated. 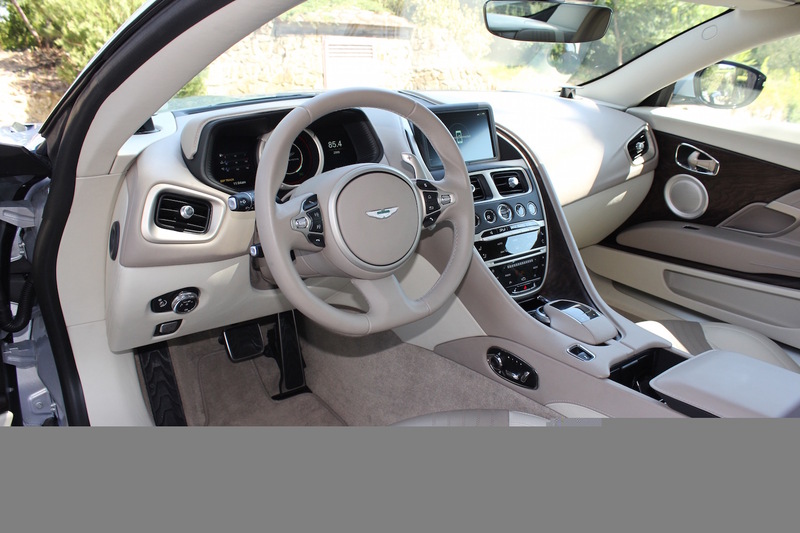 This is certainly Aston Martin’s most sumptuous cabin ever, with contemporary conveniences to please occupants even when the DB11’s all-new V12 is in its most tranquil state. 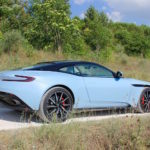 Emission and fuel economy restrictions have hit some automakers harder than others, and Aston Martin is perhaps the most compromised. 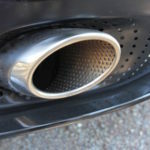 Its fleet of high-horsepower, naturally aspirated, large-displacement vehicles makes no attempts to mask dedication to performance and acoustic thrills over environmental friendliness. 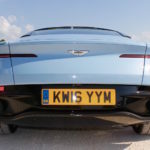 Alas, the regulatory hammer is falling, but Aston has found a compromise worthy of its new mantra. The DB11 is powered by a new 5.2-liter twin-turbocharged V12 that spools up 600hp and 516 lb-ft of torque. 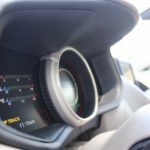 Connected to a ZF 8-speed automatic gearbox, the sports car catapults to 60 mph in 3.9 seconds and effortlessly muscles its way to a 200 mph top speed. For now, the DB11 is available exclusively with 12-cylinder power, but we can expect a bi-turbo V8 from Mercedes-Benz to slot under the hood in the near future as an entry-level variant. Despite its larger dimensions, the DB11 is 86 lbs lighter than the outgoing DB9, augmenting the potency of its more powerful engine. Aston’s engineers have also managed to pull the powertrain completely behind the front axle, a first for the brand. Rounding out the performance enhancements are a dynamic torque vectoring system and adaptive drive modes. The latter system can independently tune the powertrain and suspension for GT (comfort), Sport (excitement), or Sport+ (you’d better be paying attention) characteristics. 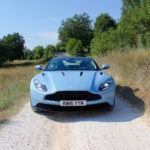 As I wend my way through Tuscany’s narrow, serpentine roads, I can imagine a satisfied smirk on the faces of Aston’s vehicle development crew. The surge of power above 3,000 rpms is deftly controlled by the DB11’s duo of braking performance and torque vectoring. In an instant, the suspension morphs from pliant to nimble, squeezing the DB11’s substantial body through tight bends with ease. Governing the car’s electric steering system (another first for AM) through each corner is equally satisfying – and confounding to my hydraulic rack loyalties. And all the while that V12 blare is rattling the hands of innocent Italians attempting to steady an espresso cup inches from their lips. 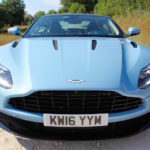 Second chances are rare for large-scale auto manufacturers, and mere pipe dreams for low-volume companies like Aston Martin. Flubbing the DB9 successor wouldn’t just hurt the brand, it would crush it. The DB11 must succeed in every single grand touring category; it must be fast; it must be modern; it must be elegant; it must be luxurious. Americans will never put stock in Aston Martin if they don’t understand it – Palmer and his team have that right. So this bit’s for you, fellow countrymen: the DB11 is infatuation. You may struggle to explain it, but all that matters is that you know how it feels, and that you can’t tear yourself from it.